Targeted seasonal guest‐worker program replace wider scope immigration policy and are expected to formalize irregular migration flows, to recruit sufficient numbers of seasonal migrants, and to provide critical revenues of source countries following the return of migrants with their earnings. 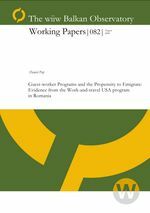 Understating temporary migrant selectivity, the experience of engaging in work‐and‐travel abroad programs (for instance, in contrast to the existing evidence of study‐abroad programs) is important for capturing the role temporary guest‐worker programs could have in the extent at which the supposed “triple win” achieved. This research found that college students that participated in the work & study abroad seasonal guest‐worker programs for college students are 38% less likely to emigrate compared to those that did not participate in the program.